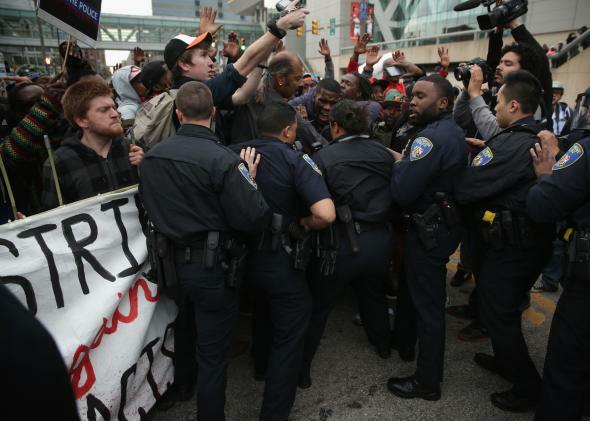 Freddie Gray Baltimore indictments: What do cops think of the charges? What Do Police Officers Think of the Baltimore Indictments? Protesters clash with police during a march in honor of Freddie Gray on April 25, 2015 in Baltimore, Maryland. Today’s indictment of six Baltimore police officers in connection with the death of Freddie Gray comes on the heels of a turbulent week during which Baltimore residents expressed fury over Gray’s death. The news that the officers are being charged—and that one is being charged with second-degree murder—occasioned widespread surprise from a public that’s grown accustomed to cops who harm civilians avoiding prosecution. Given that Darren Wilson, in Ferguson, and Daniel Pantaleo, in Staten Island, were not charged in connection with the deaths of Michael Brown or Eric Garner, respectively, that’s not a perspective many Americans share. But, at least based on the small sample of people in the law enforcement community I was able to reach this afternoon, Taylor’s lack of surprise at the charges seems to capture the feeling among some cops.